We left the comforts of our fine beach hotel after a late breakfast and set about striking off another 350 kilometres, crossing the country and we're now on the East side of Thailand, steadily zig-zagging our way northwards. 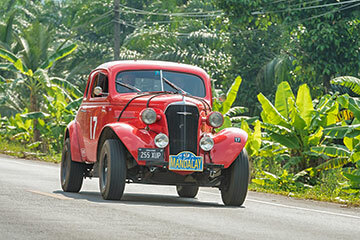 Our creative route-plan involved several turnings off main roads for interesting loops into unspoilt coconut groves – we are certainly seeing plenty of the real Thailand this way. There was just one competitive section today, a Regularity-test set in rolling hills surrounded on either side by a bamboo forest. The Syd Stelvio hero of the day award goes to Phil Garratt and Kieron Brown who guided their Chevrolet Fangio Coupe through the day without losing any penalties at all, including a spot-on clean sweep of the regularity test, which tightens the position at the top of the leaderboard in the Vintageants Category. Bill Shields’ lead has now been sliced down to just 14 seconds. Daniel Day also had a good run and was six seconds down on Phil and Kieron, Rudi Friedrichs in the Alvis was four seconds down, and Caroline Greenhalgh was just two seconds adrift despite the ominous-sounding grinding noises from her back axle, two seconds down was also the score of Mike Butler, Anton Gonnisen, and Lars Rolner. Some excellent results are being turned in by several Vintage crews. In the Classics division, three cars managed to drop no penalties at all. The yellow Mustang of Rob Garnsworthy and John Teasdale cleaned the day with no loss of penalties, so too did the red VW Karman Ghia of Patrick and Christine Sommer, who have enjoyed the best day so far, along with Dirk de Groen and Alexandra de Lespinasse, in a Mercedes. Peter Lovett in the two-litre Porsche and Grand Tromans in the Datsun 240Z both dropped a single second, a good enough result for Peter to close the gap on Gerry Crown, who dropped eight. Paul and Sandra Merryweather dropped two seconds, in fourth overall spot. Nicholas Pryor and Lesley Stockwell dropped just three seconds, their Volvo PV544 is holding 9th overall, a better day after being baulked by trucks yesterday which had cost them dearly. Stan Gold and Brant Parsons also had a good day, dropping just two seconds of the regularity in their 911. 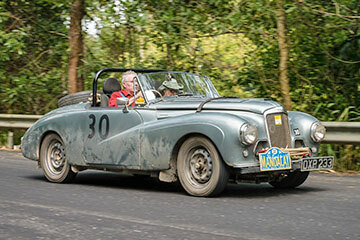 David and Jo Roberts lifted their 1954 Sunbeam Alpine, similar to the car Stirling Moss used to rally in the 1950s Alpine Rally, dropping five seconds, the car is in 15th spot, ahead of a Mercedes and a Datsun 240Z. Tomorrow is a long day so an early morning start to knock off another 500 kilometres.